With the world becoming more digital, connected, mobile and service-driven, the retail industry has shifted from a product-driven to a customer-centric direction. If you’ve ever ordered a product off Amazon or reserved a table at your favorite restaurant online you know what I’m talking about. Technology has disrupted the retail industry, making us increasingly independent through mobile technology. Now digitalization is slowly making its way to the automotive retail industry. Automakers have realized that people have become accustomed to the fast-paced and connective lifestyle. Thanks to the savings of employing digital practices, automakers have started to adopt digitalization into their strategies. Augmented (AR) and virtual reality (VR) have penetrated numerous industries since inception, including the automotive industry especially. Automakers are making use of AR and VR in both marketing and selling practices. This technology is both accessible at the comfort of your own home as well as certain dealerships. AR and VR technology provide an additional service layer to widely available Internet data and information – customers now have an in-depth visualization of their car with the ability to make changes to both interior and exterior features. With this technology, customers are able to test drive and experience their customized vehicles online like never before. So what’s the difference between augmented and virtual reality? AR layers computer-generated enhancements atop an existing reality providing the ability of virtual interaction. VR, however, is an artificial, computer-generated simulation of a real life environment/situation. It is immersive and stimulates both your senses of vision and hearing. In automotive retail, AR is mainly being used to showcase vehicles to the customer from a third-person point of view with the chosen specs and options. VR, on the other hand, provides an immersive first-person experience with an in-car experience for viewing the interior of the car as well as test-driving. With AR and VR technology, although still in its infancy with a lot to be improved, automakers and their dealers will enjoy significant cost cuts. Dealerships today spend endless amounts of cash on showroom space and according to Bloomberg, spend approximately $2.75 billion annually in interest to keep new vehicles on their lots. Furthermore, giving the customer a compelling experience leads to increase sales and higher specification purchases. According to a study by Ernst-Young, consumers spend an average of 10 hours scouring the web before purchasing a car. The Internet provides customers with easy access to tremendous amounts of online data and information, cutting out the need for a dealership visit. With a large part of the vehicle-purchasing journey already online, it’s only a matter of time until buying a car over the Internet becomes more common. Both automakers and retail companies are experimenting with online automotive retail. 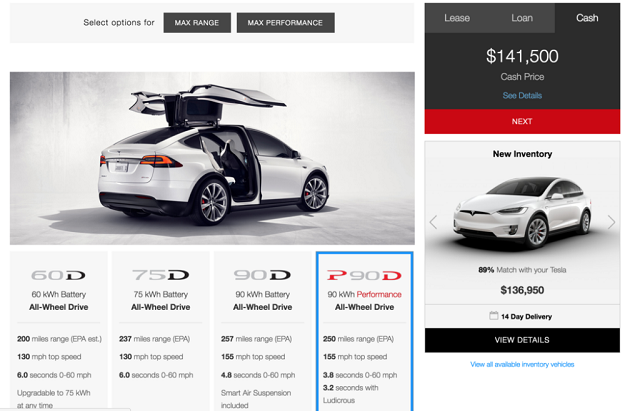 One of the first automakers to take vehicle sale online is Tesla. Ordering a Tesla is exactly like any buying experience you've had on the Internet. Simply choose your specs and options, preview the car using their 3D configurator and then indicate your preferred delivery timing. 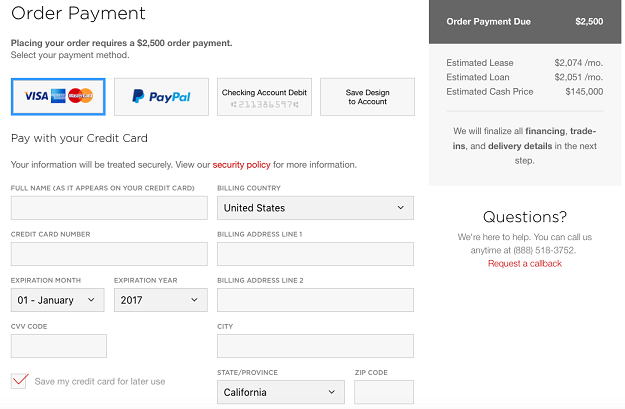 After entering your contact information and paying the $2,500 order payment, your final payment is also conducted online. Customers have the option to pay via electronic bank account debit or wire transfer. Ordered vehicles are then custom built and delivered to a Tesla service center nearest to you for pickup. Other automakers such as Hyundai, Mercedes, BMW and Volvo have also started to set up their own small experiments selling their cars through their company websites. Similar to Tesla’s sales model, customers can also configure their cars online, pay a deposit and have their car delivered. Volvo has experienced tremendous success with online retail. Last year, Volvo was able to sell its entire 1,900 special edition SUVs exclusively online and now plans to offer its entire line-up. Even retail giant Amazon recently announced its interest in selling cars online. With plans to build its new Luxembourg-based retail unit, Amazon will trial the online sale of cars in the U.K before expanding to other regions around the globe. According to Auto Express, customers may be able to spec, customize and order their car via Amazon and then have their vehicle delivered to a nearby dealer. With all of Amazon’s success in the retail market, its involvement in this space will significantly disrupt dealer operations which may motivate automakers to shift their retail approaches online. Due to massive amounts of online data and 3D configurators, car buyers today know exactly what car they want before ever setting foot in a showroom. This fact begs for a change in automotive retail. With some automakers reluctant and others slowly shifting their sales model, start-up Carvana (considered an online retailer) has decided to capitalize on this and start offering consumers vehicles through massive automobile vending machines. Carvana allows you to buy a car just as easy as grabbing a soda from a vending machine. The customer starts by going online and checking out Carvana’s vast inventory. The customer has access to a 3D representation of the car inside and out, its specs, maintenance history and options. The customer can then buy the car, get approval of financing and even get the trade-value of their current car in just minutes. The car is then delivered and loaded at the nearest Carvana vending machine or delivered to their door. For vending machine pickup, a unique oversized coin is sent to the customer, which is put into an oversized coin receptacle on location. The vending machine then grabs your car, rolls it down and deposits the customer’s car into a bay – and that’s it, the customer just drives off into the sunset. Carvana also offers customers a ‘7 days no questions asked’ return policy with a 100-day warranty. Another Singapore-based company called Autobahn has also built their own automotive vending machine. However, Autobahn exclusively provides luxury pre-owned vehicles. From the comfort of a sofa on the ground floor, potential buyers can view the inventory of between 70 and 80 luxury cars and then order their car using a provided tablet. Once a selection is made, a promotional video of that car is played while the vehicle is automatically transported down to the customer. These vending dealerships not only cut costs by eliminating the need for a sales force but also provide profit increase through space cost-savings. Where traditional dealerships require five to ten times the space to store all their vehicles, Carvana and Autobahn store their entire inventory in just one the massive vending machine. With Carvana expanding, expect to see more of these vending machines pop-up in no time. As bad as it is for technology to take away our jobs, corporations see technology as a huge paycheck. Automakers spend a lot of money figuring out how to save it and technology is their number one answer. Therefore, we may see the above retail models being implemented much sooner than later. However, automakers and dealerships will have to make a concerted effort to succeed, which is much easier said than done. Furthermore, a large amount of the consumer population still enjoy dealing with humans instead of technology which is why automakers will need to think long and hard before shifting their retail strategies.